George R.R. Martin, recorded in 1991, interviewed by Richard Wolinsky & Richard A. Lupoff. As Game of Thrones enters its final season, we can look back on the career of George R.R. Martin, to the days before his fantasy series was published, when he was best known as a writer for television, though he’d already written novels and short stories. 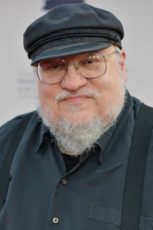 In 1991, five years before the publication of Game of Thrones, and evidently before its conception, Richard Wolinsky and Richard A. Lupoff and I had a chance to chat with George R. R. Martin. At the time, he’d just completed work writing for the television series, “Beauty and the Beast,” and most of his interest concerned television and its standards and practices. As you listen to the interview, you can discern elements that will play a role in the genesis of Game of Thrones. Digitized and re-edited by Richard Wolinsky in 2014.